The Australian Idiopathic Pulmonary Fibrosis Registry (AIPFR) is a unique research platform that collects information on patients living with IPF to better understand this rare and complex disease. The AIPFR was the first national IPF registry established in the world, and operates to facilitate collaboration across institutions, states and disciplines to further research into IPF. 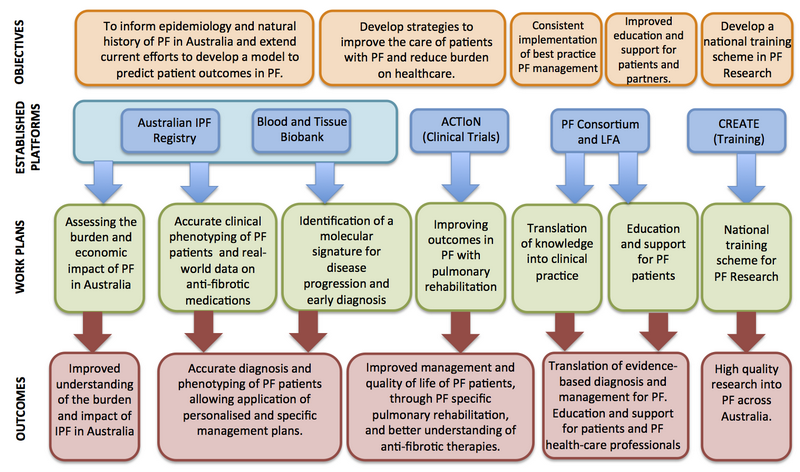 The registry recruits patients from every State and Territory in Australia, collecting serial data from participants, physicians as well as clinical investigations and operates in tandem with a linked biobank that provides researchers with plasma, serum and genetic material on this large and well phenotyped population of IPF patients. With established ties to recognized global centres, the AIPFR provides a central source of rich data to facilitate both national and international epidemiological, medical and clinical trial research projects. In mid-2000, a well-known Tasmanian businessman and patriarch of a prominent Hobart-based philanthropic family, very tragically developed rapidly-progressive IPF. As a result of this diagnosis, he was keen to encourage local research to investigate mechanisms of fibrosis in respiratory tissue and therefore set up a financial support program to facilitate this laboratory work within the UTAS Respiratory Research Group (RRG). Although the RRG was mainly focused on mechanisms of small airway fibrosis in COPD rather than IPF at the time, over time, this lead directly to substantial advances in understanding of the basic pathogenesis of smoking-related COPD and major NHMRC funding. Despite being listed for lung transplantation and before this could take place, this inspiring man passed away. His family were committed to continuing his legacy through the support local IPF research and suggested a local clinical program of excellence in IPF, with the intention of it expanding to become a national initiative. As a result, it was decided that the RRG would set up a “pilot” effort and create a Tasmania-wide state Registry of IPF patients. This local pilot was inaugurated in 2008, and over the next two years, with wide support from Tasmanian respiratory clinicians, proved its potential as an effective platform for clinical improvement and research. In Oct 2010, Prof Haydn Walters, on behalf of his Tasmanian research and clinical colleagues, met with Mr William Darbishire, CEO of LFA at the time, and Dr Ian Glaspole, chair of PIVOT (now known as the Rare Lung Disease National Advisory Committee) at the 3rd National Lung Cancer Conference in Melbourne. It was here that Prof Walters provided the background to the Tasmanian Pilot IPF Registry as well as detailing its success and began the pitch to LFA to auspice a national Australian IPF Registry (AIPFR). LFA undertook its own independent due-diligence of this AIPFR initiative, and determined who the national collaborators, steering committee and leadership team should include and ultimately agreed to proceed with the national initiative as proposed. The rest as they say…is history! With two NHMRC project grants and the CRE-PF under its belt, the AIPFR is not just up and running, but it has been a success since its inception. Despite of or in light of its success, it is important that we never forget its “story” and remember, with respect, the professional, human and indeed tragic circumstances behind its origin. For further information on the Australian IPF Registry please see the Lung Foundation Australia website. In 2014, a national blood biobank linked to the AIPFR was established. The biorepsository is centrally managed and specimens are stored at the Institute for Respiratory Health in Western Australia. Specimens are collected and stored for IPF registry participants in all states and includes DNA, RNA, plasma and serum. For Stage One recruitment, we have just over 200 patient blood samples. Stage Two recruitment has commenced and is ongoing. Research into the pathogenesis of PF requires access to appropriate tissue specimens. While widespread use of animal models has advanced respiratory research, the gold standard for understanding human physiology and paraphysiology is access to human tissue collected in a standardised fashion from both normal controls and carefully phenotyped PF patients. The Australian PF Lung Tissue Bank will facilitate integration of data from animal models and clinically-phenotyped PF patients to improve the utility of pre-clinical animal models of PF that are on the critical path to new and better medicines. Lung tissue banks linked to the four Australian lung transplant programs have been established. The CRE-PF will develop a national PF framework, consolidating local initiatives into a single national approach. This collaborative approach pools resources and will accelerate our understanding of the pathobiology of this fatal disease. Patients with pulmonary fibrosis undergoing lung transplantation provide informed consent for their lung tissue to be stored in the lung tissue bank, allowing the tissue to be accessible for future studies. Each biorepository will collect samples linked to de-identified clinical data that will be available to the pulmonary fibrosis scientific community with appropriate ethical approvals.